284 pages | 2 B/W Illus. The westernized university is a site where the production of knowledge is embedded in Eurocentric epistemologies that are posited as objective, disembodied and universal and in which non-Eurocentric knowledges, such as black and indigenous ones, are largely marginalized or dismissed. Consequently, it is an institution that produces racism, sexism and epistemic violence. While this is increasingly being challenged by student activists and some faculty, the westernized university continues to engage in diversity and internationalization initiatives that reproduce structural disadvantages and to work within neoliberal agendas that are incompatible with decolonization. 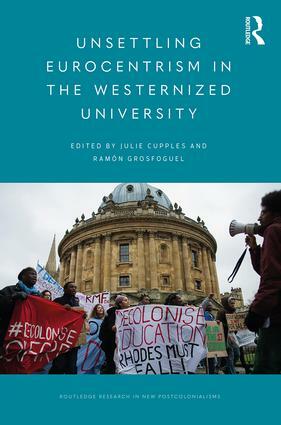 This book draws on decolonial theory to explore the ways in which Eurocentrism in the westernized university is both reproduced and unsettled. It outlines some of the challenges that accompany the decolonization of teaching, learning, research and policy, as well as providing examples of successful decolonial moments and processes. It draws on examples from universities in Europe, New Zealand and the Americas. This book represents a highly timely contribution from both early career and established thinkers in the field. Its themes will be of interest to student activists and to academics and scholars who are seeking to decolonize their research and teaching. It constitutes a decolonizing intervention into the crisis in which the westernized university finds itself. Julie Cupples is Professor of Human Geography and Cultural Studies at the University of Edinburgh, UK. Her current research is focused on indigenous and Afro-descendant media activism in Central America and Aotearoa New Zealand. She is the author of Latin American Development (2013) and co-author of Communications/Media/Geographies (2017)and Shifting Nicaraguan Mediascapes: Authoritarianism and the Struggle for Social Justice (2018). Ramón Grosfoguel is Associate Professor of Ethnic Studies at the University of California, Berkeley, USA, and a senior researcher at the Maison des Sciences de l’Homme in Paris, France. He has published many articles on the political economy of the world system and on Caribbean migrations to Western Europe and the United States. He is author of Colonial Subjects: Puerto Ricans in a Global Perspective (2003) and co-editor of Latin@s in the World System: Decolonization Struggles in the 21st Century US Empire (2005)and Decolonizing the Westernized University (2016).